Storm Gym fighter Isla Patsalides had her very first decision bout last weekend at the Palace Theatre, Watford on the MFL promotion, Fighting Legends. The seven-year-old who is one half of a set of identical twins, took on Mia Indrika of Lions Gym, earning the decision on all three scorecards. Isla, whose three sisters also fight for Storm Gym, is trained by her dad Aiden, plus Amir Subasic and Giannis Skirdillis. 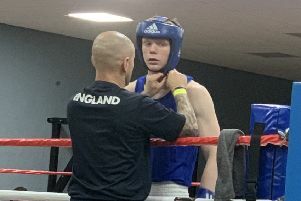 She has a very aggressive fighting style and has set her sights on bout number two on her father’s K1 promotion Amateur Kings on Sunday, July 15 at the Chiltern Hotel. Meanwhile, she also hopes to follow in her big sister Roma’s footsteps with UK number one ranked status.